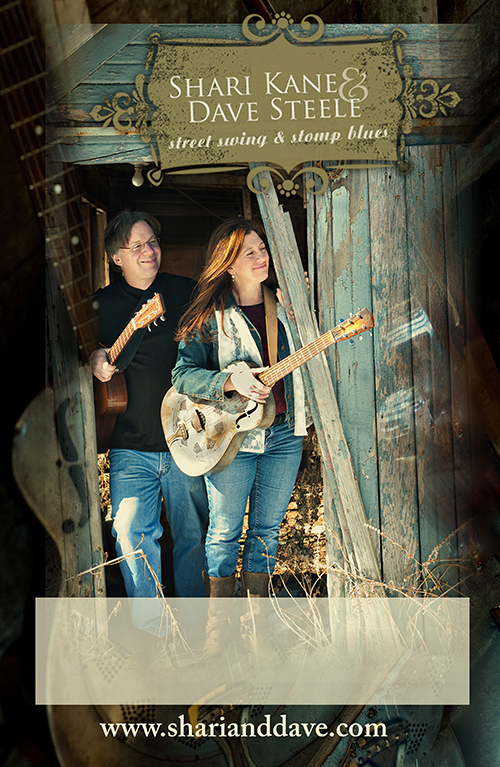 Shari and Dave throw a four handed acoustic party – street swing, stomp blues, mountain twang – music from the holler and swamp. 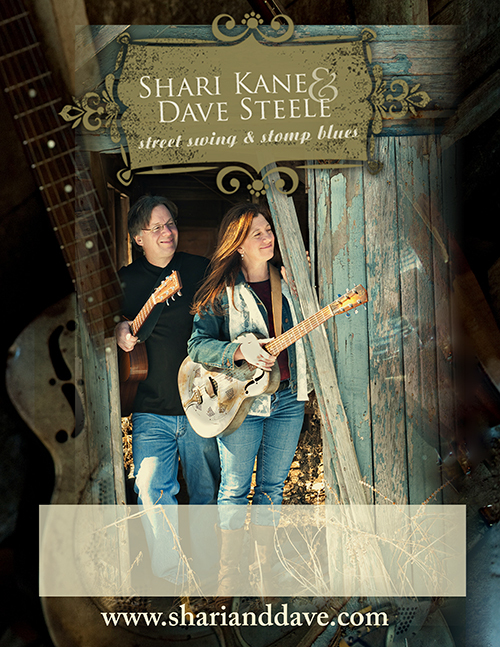 Shari and Dave throw a four handed acoustic party – street swing, stomp blues, mountain twang – music from the holler and swamp. Blues and gospel shouting, stellar fingerpicking, deep slide, banjo, dobro, mandolin, and Appalachian harmony singing. Gary Davis meets Dock Boggs and Muddy Waters and they share a jug. 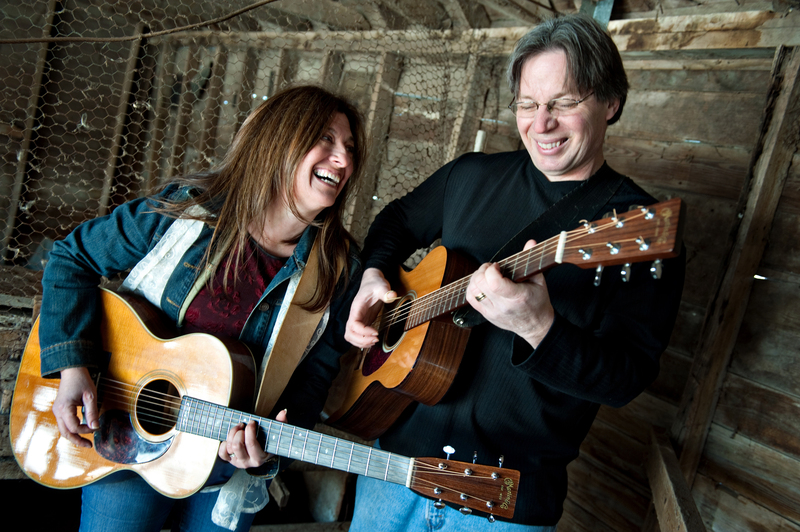 Shari and Dave shows are steeped in folk and blues roots, blended with Appalachian grind – serving up an intoxicating acoustic brew. Dave’s smoky vocals, percussive rhythm and innovative lead, and Shari’s crisp picking style, rootsy leads, and stinging slidework are a testament to sounds once heard on the streets of Harlem, juke joints of Mississippi, the Carolina hills or the jug bands of Memphis. 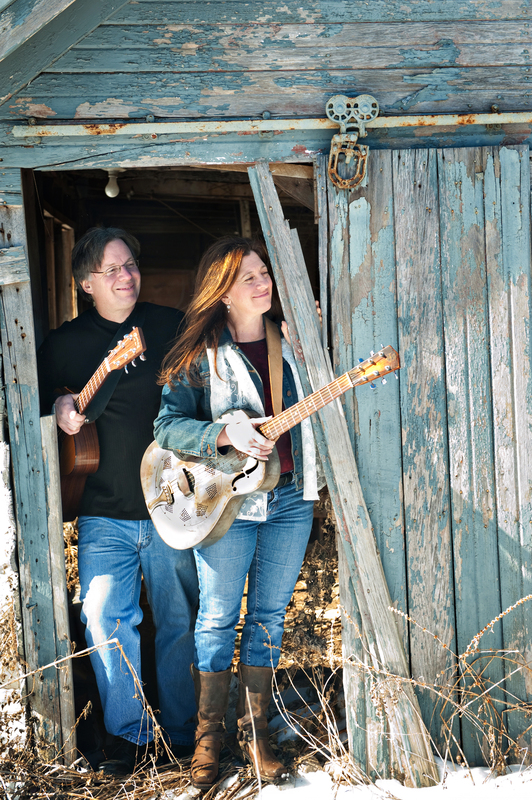 If you like pure, honest acoustic blues then you should definitely listen to “Feels Like Home,” recorded by the American couple, Shari Kane and Dave Steele. Both play acoustic guitar and sing. The fourteen tracks include two originals and diverse covers of old masters like Robert Johnson, Reverend Gary Davis and Mississippi John Hurt. A surprising treat kicked off the CD with Chuck Berry’s “Thirteen Question Method”. As players, they mesh together perfectly as demonstrated by their take on Blind Blake’s “Early Morning Blues”. They add a harmony vocal track and seamlessly merge Blake’s tune with “Ton Of Blues” by Dutchman, Ton van Bergeijk. Later they repeat this experiment by linking “Milwaukee Blues,” by Charlie Poole, to the Texas fiddle tune, “The Beaumont Rag”. The merger is logical and compelling in the hands of these two musicians. 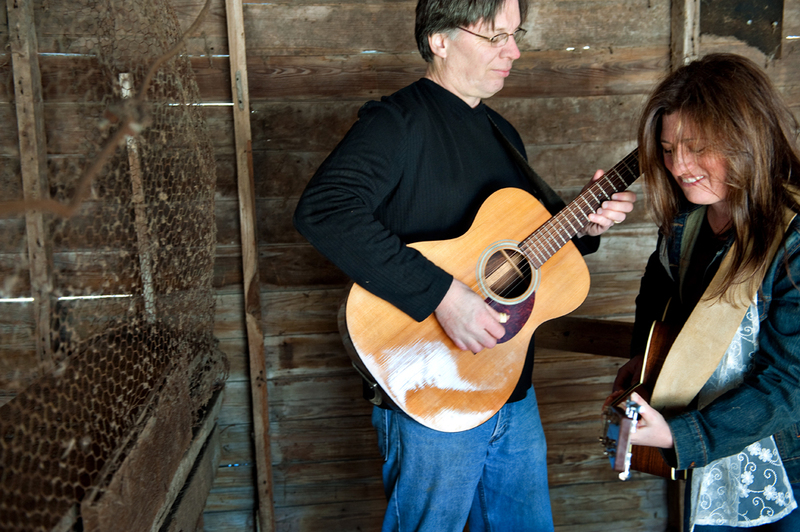 Shari and Dave are both passionate, skilled musicians. Dave’s mandolin is strong on Dock Bogg ‘s “Country Blues”. Shari plays slide beautifully on “Sitting On Top Of The World” by the Mississippi Sheiks. The two original songs Dave wrote, “If I Don’t Jump” and “The Last Day of Summer,” fit perfectly with all these classics; they draw from the same atmosphere. The couple makes and plays this music with conviction. The best example of their skill is displayed in the jazzy blues-leaning instrumental,”Guitar Blues” by Lonnie Johnson and Eddie Lang. They also honor “I Will Do My Last Singing In This Land” by Reverend Gary Davis. by performing the tune as a soulful duet. As compelling traditional music, this release deserves a listen. Warm and delicious as hot buttered cinnamon toast, as easy and relaxed as a rewarding after-dinner talk and as soothing as Sunday morning. That’s my immediate reaction to Feels Like Home, the new CD by Shari Kane and Dave Steele. It’s a perfect complement to the couple’s first CD, Four Hands Blues. They continue their loving exploration of classic American music including Piedmont and Delta blues along with mountain gospel, Appalachian ballads and ragtime swing guitar. What differentiates Feels Like Home from Four Hands Blues is the home setting. 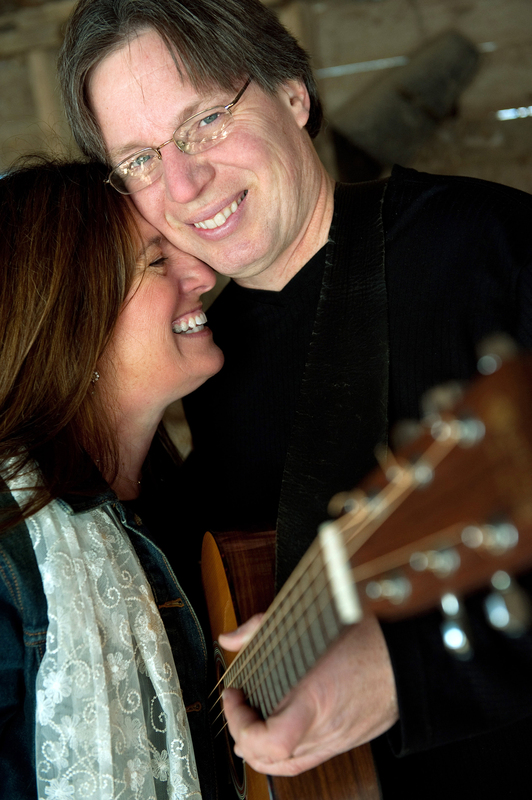 Shari and Dave built a home studio and took their good sweet time working through each song. We eavesdrop on their intimate conversation involving call and response from acoustic guitar to mandolin to voice. Dave Steele’s voice has grown richer and warmer over the years since he was the lead singer for the legendary Ann Arbor blues jump band, Big Dave and the Ultrasonics. His inflection and natural vibrato are the magic touch necessary to tell these heart-felt stories. Shari’s harmony is delicate, yet deep. Even a cursory listen illustrates her keen ear. Their voices blend perfectly as do their instruments. Both are highly sought as guitar teachers. They possess terrific technique, but moreover they share honest feeling and emotion. In our era of downloads and single selections, this is old-school listen all-the-way-through music, like a classic Mississippi John Hurt or Reverend Gary Davis album. It is very difficult to pick out a standout selection among the fourteen melodies they interpret, but I’ll try: for mandolin mastery go for the Doc Boggs’ tune Country Blues. For tight harmony don’t miss Early This Morning / Ton Of Blues and for syncopation revel in Guitar Blues. Better yet, pick up the whole CD and come up with your favorites. Bet you can’t pick just one. We want to book you guys!